On January 4, two attacks were directed at USG personnel in Afghanistan (see US Embassy Kabul: January 4 Attacks Target USG Employees at Camp Sullivan). On January 5, the “I survived this yesterday, took a photo and then quit my job” thread went live on Reddit with user DanDalVlan, an Air Traffic Controller contractor in Afghanistan who survived the VBIED attack of a USG site near the Karzai International Airport. Sorry, I forgot to put the story up. I was living at the compound that got attacked by a Taliban VBIED (Vehicle-Borne Improvised Explosive Device) that was inside of a very large truck. It rendered our compound pretty much useless. Luckily, we had no fatalities with mostly minor injuries (myself included). I was working as an Air Traffic Controller out there. The country of Afghanistan doesn’t have the infrastructure to control their own air traffic, so it is contracted out and I was one of those contractors. Edit I’m editing this just to say that I’m falling behind on answering questions, but I’ll answer them as soon as I can. 2nd Edit I’m officially failing in my attempts to answer questions and reply as fast as they come in. Sorry if I have missed anyone. He was asked about how successful the Taliban has been in attempting to influence the region. He was asked if entertainment is imported? He was asked about his Top Ten Favorite Boardgames. Somebody wanted to know if the bomb ruptured his ear drums? I have my ID and passport and some clothes. Everything else is pretty much toast. I’m most sad about my boardgame collection. The Reddit post was submitted on January 5. It currently has 2605 comments, and 5,867 points (96% upvoted). 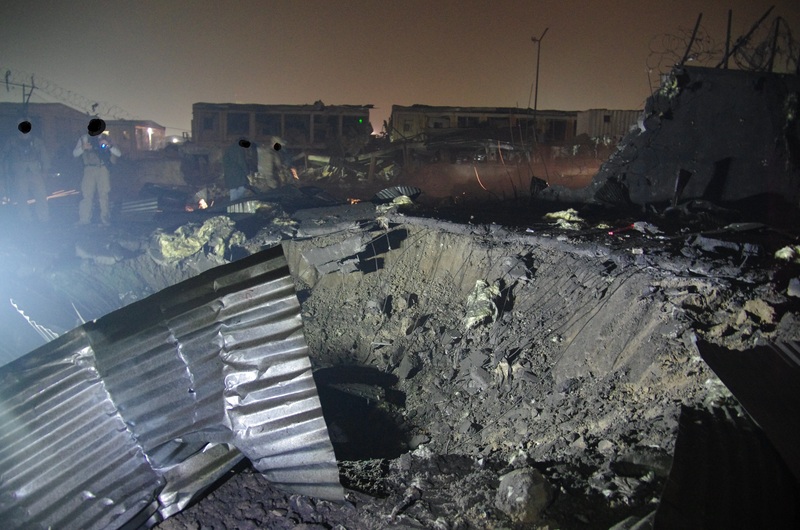 The photo submitted in the aftermath of the attack is here. Due to difficulties associated with developing Afghan capacity for managing the civil aviation system, FAA officials and coalition forces concluded that effective future operation of Afghan airspace would require the development of a third-party contract for providing airspace management services. Accordingly, in 2013, FAA and coalition forces assisted MOTCA in preparing a contract that included provisions requiring the contractor to train Afghan personnel, similar to the structure of the Afghan-centric aviation security contract. The United States planned to transition airspace management responsibilities back to the Afghans at the end of 2014, but, partly due to a lack of certified air traffic controllers, that did not occur. […] Due to the potential for air service disruption, the Department of State funded an interim, DOD-managed contract for $29.5 million to provide the services through September 2015. If a follow-on contract is not awarded before this contract expires, the United States could be called on to fund another interim contract.